[Episcopal Diocese of Newark] The Rev. Carlye J. Hughes was chosen 11th bishop of the Diocese of Newark during a special convention on May 19 at St. Peter’s Episcopal Church in Morristown, New Jersey. 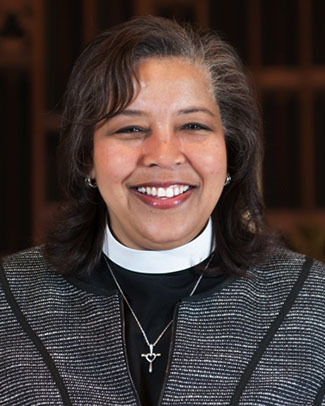 The first woman and first African-American to be elected bishop in the Diocese of Newark, Hughes, 59, is currently rector of Trinity Episcopal Church in Fort Worth, Texas, in the Diocese of Fort Worth, and was one of three nominees. In order to be elected, a candidate needs to receive a simple majority of votes from both the clergy and the lay delegates, voting separately as orders in the same balloting round. Hughes was elected on the first ballot, receiving 62 of 116 clergy votes and 141 of 241 lay votes. After thanking the Search, Transition and Standing committees for their work, she said, “I am really aware that moments like this do not come in a vacuum. It takes a village to discern a call to the episcopacy, and it is the generous and fruitful ministries of Bishop Beckwith, the Rev. Lisa Hunt, the Rev. Canon Scott Slater, the congregations and people of the Diocese of Newark, and the people of Trinity Episcopal Church in Fort Worth, Texas who have opened the door for us to be in ministry together, and for that I am deeply grateful.” Watch video of Bishop-elect Hughes’ remarks. Hughes was ordained a priest in 2005 after graduating from Virginia Theological Seminary, and has served as rector of Trinity Episcopal Church in the continuing Diocese of Fort Worth since 2012. No stranger to the northeast, her first call was to St. James’ Church on Manhattan’s Upper East Side. Before ordination, she worked as a corporate trainer. She is married to David Smedley. More about Bishop-elect Hughes. Pending consent of a majority of the bishops with jurisdiction and the diocesan standing committees, Hughes will be ordained and consecrated September 22, 2018, at the New Jersey Performing Arts Center in Newark. Presiding Bishop Michael Curry will preside. — Nina Nicholson is the director of communications for the Diocese of Newark. This is wonderful news and appropriately at Pentecost! The clergy and people of Newark will be blessed in their new Shepherd.